Impact structures in the solar system are mainly recognized and explored through remote sensing, and on Earth through geophysical deep sounding. To date, a continuous scientific sampling of large impact craters from cover rocks to target material has only seldom been performed. 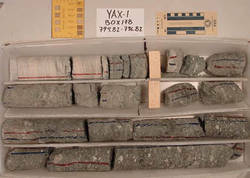 The first project to deep-drill and core into one of the largest and well-preserved terrestrial impact structures was executed in the winter of 2001/2002 in the 65 Myr old Chicxulub crater in Mexico using integrated coring sampling and in-situ measurements.